A few months ago I saw a snowmen quilt using the snowball block. I had it saved and now can't find it. Does anyone remember it and could you help me find it? 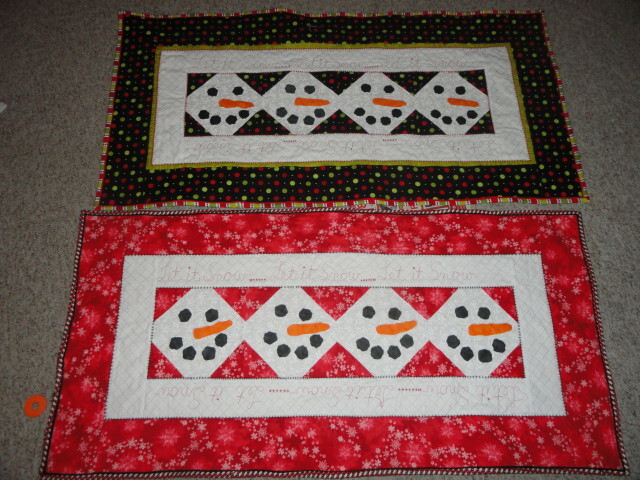 I have my small quilts made with the snowmen but can't remember what the eyes and mouths looked like. Thanks for your help. Thanks for trying but the one I am looking for had button eyes and mouth (I think). that's certainly the one I was thinking of. I am sure it would be helpful to offer a picture QuiltE, IF I KNEW HOW TO DO THAT, I am really stupid when it comes to computers. I am so sorry I can't be more helpful. Was it the whole snowman, a group of snowmen, all pieced or appliqué or just the faces? There was one of snowmen looking in through a window too. Full sized bed quilt or wallhanging? It's really not that hard to post pics. Tartan, it look like a wall hanging. Scrappy snowball blocks with button eyes and mouths and appliqued orange noses. I think there were 4 or 5 blocks wide and 6-7 blocks long with a border of some sort. Try using the search box at the top of the site. I tried typing in snowman wallhanging and snowman table runner and several came up. Some were the snowball block but others were appliqué. I didn't see any made from scraps though. We're the snowmen made from different white scrap squares? you can find it at quilthollow.com. I have it pinned in my pinterest. I plan to make it one of these days. I first saw it in a booth at Paducah in April. Last edited by Watson58; 08-04-2013 at 07:34 PM. That is it ! ! Watson 58, thank you so very much. I have made two , that are much smaller. I appreciate your effort and time in searching for me. Connecting threads has a snowman table runner pattern or kit that looks cute. what is the name of the pattern? I can't get into Pinterest without joining by that link and can't see it on the .com site. The pattern can be found at Farmhouse Threads. The pattern is #906 Let It Snow. I made one row of that snowman quilt last year as Christmas gifts for a lot of my family and friends. They all loved it . It made a great table runner. I made 10 of them. They go pretty fast.